This article will show how to get Blu-ray/DVD/VCD collection backed up and at the same time get them converted to 1080p format supported by Apple TV 3. Apple TV is a digital media player, it is a small network appliance designed to play digital content from the iTunes Stone, Netflix, YouTube, iCloud, etc. The supported formats show that Apple TV does not support to play DVD directly. However, I want to get my DVD and VCD collection backed up and at the same time get them converted to 1080p format which supported by my Apple TV 3, so that I could use the output video for entertainment playing on TV. Then I searched in google using “dvd video converter”, Pavtube does not figure in the top results while the other like wondershare, avs, ameersoft, etc, but I was luck to just do a random search to compare with wondershare before I bought and come across Pavtube Video Converter Ultimate (Mac version: iMedia Converter for Mac). It is easy and quick to get started with UI. The most important thing is the support for Apple TV 3 format. Insert the program to your computer, and then launch it. Click the “Load file” icon to load your Blu-ray/DVD/VCD files. It also supports ISO/IFO files. 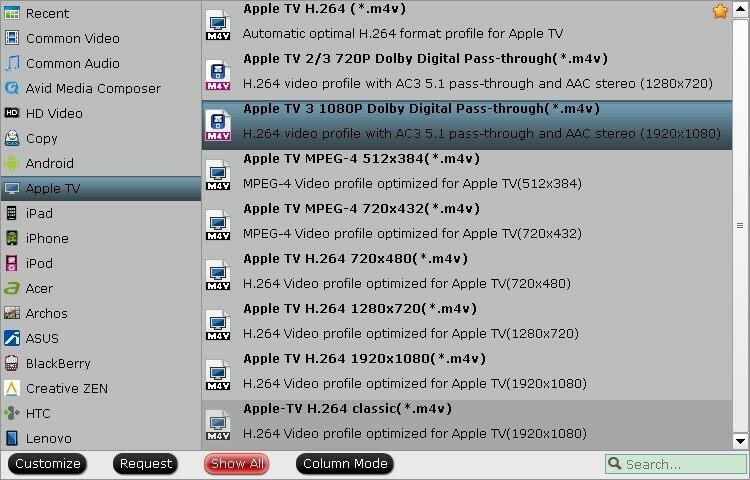 Pavtube has designed many different formats for Apple TV. In order to get the most suitable format for my Apple TV 3, I usually choose “Apple TV 3 1080P Dolby Digital Pass-through (*.m4v)”. I can also adjust video size, bitrate, frame rate, audio codec, channels, etc according to my own needs. But the original settings are good enough for me to be play on my Apple TV 3 with good quality. 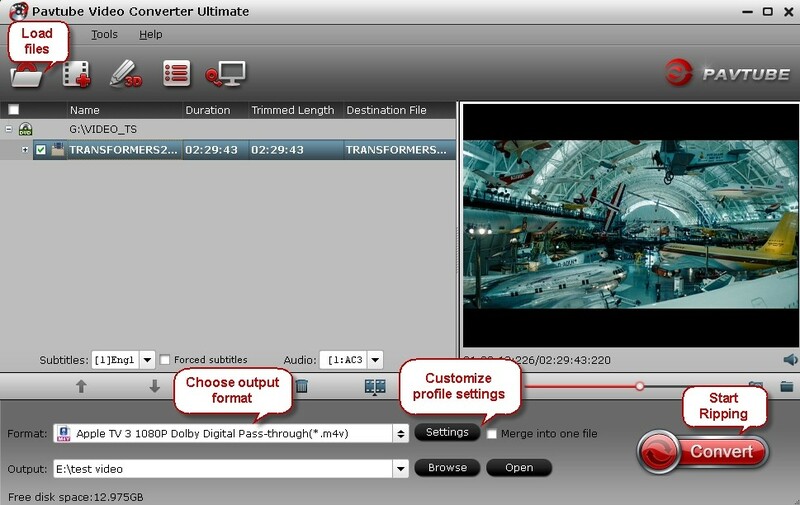 PS: Pavtube is so sweet that it gives a tip for customers about the audio track. The last thing you need to do is just click the convert button to start the conversion of DVD to 1080p format for Apple TV 3. When the conversion is over, I just need to find my output videos and transfer to my NAS or iTunes through Apple TV 3. It is so easy and save much trouble for me. If you also want to view your Blu-ray/DVD/VCD collection on your Apple TV, just have a try, you will like it!